v4.37 has a dynamically configured UI that can show only the supported PIDs for the attached responders. DMX512 data stream using any console or controller. v4.37 allows all DMXter4 or 4A units to be the line interface and data/timing collection device for RDM Integrity. v4.37 adds our expanded responder simulator and add DMX512 baud rate measurement. The DMXter tm family of DMX512 testers inaugurated the field of DMX testing. Rugged enough for use at a load in - accurate enough for the leading design labs, DMXters are the world's standard for testing and verifying DMX512. 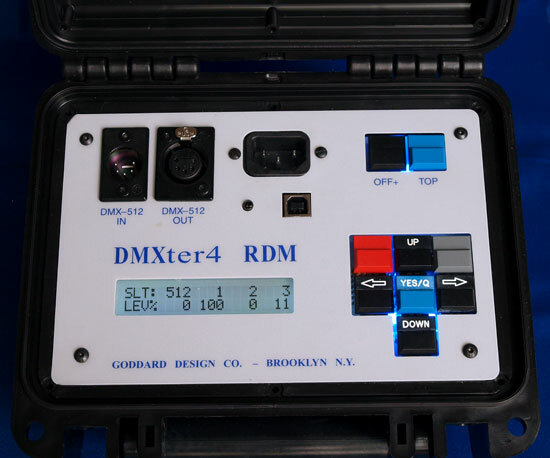 The DMXter4 RDM provided expanded DMX testing along with support for RDM (E1.20) testing and configuration. The DMXter4A allows increased interaction with external test systems. The v4.37 software together with the 4A hardware adds a major new capability. Now you can take a live DMX512 data stream from any 485 style source and add RDM commands generated by the DMXter to that stream. This can make configuring an RDM enabled fixture easier and interactive. You will see the command interact with the DMX data as it is acted on by the responder. For equipment designers and evaluators this allows testing in a real world environment. Any DMX/RDM interaction can be found and troubleshot. The DMXter4A is simple to use. Eight buttons run its menu-driven software. The DMXter4A uses a back lit 40-character display. Some functions can be output to a PC using the USB port. Software updates are done via the USB port. The unit comes in a sturdy water-resistant case, tough enough to ride in your tool kit or cable hamper. The DMXter4A should be easily used by anyone who has used a Lil’DMXter; however you will see and feel many subtle (and not so subtle!) improvements. All DMXter4A RDM units discover, query status, perform device configuration, and test RDM responders. The software now supports all E1.20, E137-1 and E1.37-2 PIDs. The list is posted. v4.37 also adds an optional dynamically configured UI that gets to the PIDs you need quickly by bypassing all the PIDs you don't need. In effect, you will see a customized interface for each responder. Designers and evaluators of RDM equipment will want our optional Advanced RDM controller software. See the DMXter4A RDM software page for the latest details on standard and Advanced packages. There is also RDM Sniffer software as an additional software option. The DMXter4A supports nine different user controlled transmit modes. The major transmit parameters, or flavors, can be set over a wide range to allow simulation of almost all DMX controller timings. The DMXter4A supports all START Codes. The DMXter4A maintains and expands our industry leading receive and analysis routines for DMX512. It measures more parameters to a higher precision than earlier DMXters. Slot levels are displayed in either a numeric or graphic display format. The graphic interface allows 32 slots to be viewed at once. Our Intercept & Modify feature lets you work on any slot without interrupting the guy at the console programing the movers. With the DMXter4A RDM you can re-time any DMX data stream to one of three conservative flavors that even the pickiest color scroller will accept. If you are monitoring a system with your DMXter4A and even the bar graph display is a bit cramped you can now view 128 slots at once using your PC as an add on. Slot levels and most other displays are available in three display formats - percent, decimal or hexadecimal. If you would like details on our binary to percentage conversion routines they are posted on the Web. Testing a cable for electrical continuity is not the same as testing it for data transmission continuity. The DMXter4A tests cables using actual data. Goddard Design pioneered Flicker Finder to verify system stability. If your lighting system is haunted, this is the routine that you need! You have a handy source of back up data for your console with ShowSaver (built in) or ShowPlayer (optional). ShowPlayer is a simple show controller storing up to 227 cues you can trigger manually, externally or by time. See the ShowPlayer data sheets for details or click here for a brief note on ShowSaver. Automatic switch-over on data failure is available with both routines. Both routines store all cue data in nonvolatile memory. All DMXters provide an output that may be used to sync an oscilloscope to the DMXter. Optionally you can use our hardware kit to sync an oscilloscope to any DMX12 data stream. The DMXter4A comes with a worldwide compatible supply that accepts 90 volts - 260 volts without adjustment. The DMXter4A is still the only tester to operate or charge from the AC mains without an external supply. The DMXter4A has a computer controlled charger and battery management system. The DMXter4A can operate from AC immediately, even with a discharged battery. The DMXter4A supports USB connection to personal computers. This facilitates software updates in the field. Use it to support more detailed data views than can easily be viewed on a 20x2 line display. This will also allow full alphanumeric entry when appropriate. For setting up and configuring your PC to use the USB port, go to using the USB port. The USB enables use of third party software where the DMXter4A is the engine. Goddard Design Co. is the North American distributor of Benjamin Electric's RDM Integrity Test software. This software can be run on any DMXter4/4A RDM or MiniDMXter4. The RDM Integrity application uses Goddard Design's industry-standard timing measurements. To Buy click on the description or enter qty in box on the right. For software updates, please give us the unit's serial and model number when asked in the shopping cart.